21 square metres. 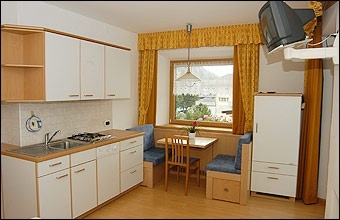 The studio apartment has been completely refurnished & has a wonderful view of the centre of Ortisei. 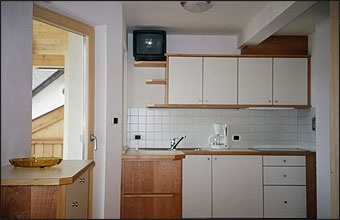 The kitchenette has a dishwasher, fridge & TV. 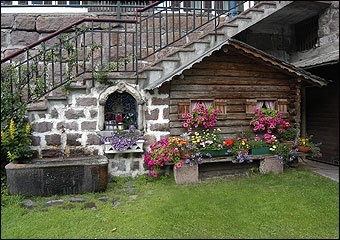 The bathroom includes bathtub & bidet. 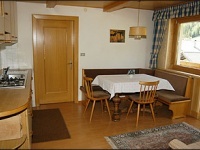 Entrance in the nearby public swimming pool, bed linen, towels, electricity and water are included in the price. 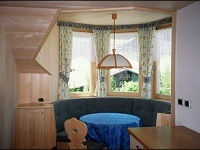 40 square metres. 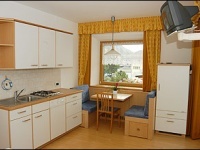 The two-room apartment has a new living room with kitchen (including dishwasher & fridge) & TV. 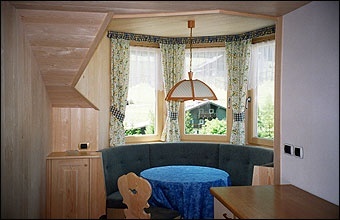 The large bedroom with bathroom has a balcony with table & chairs. 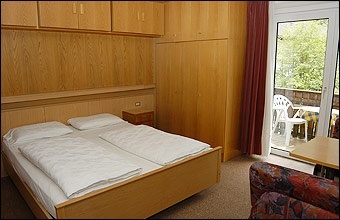 Entrance in the nearby public swimming pool, bed linen, towels, electricity and water are included in the price. 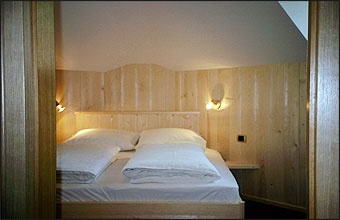 48 square metres. The apartment consists of 2 bedrooms & 2 bathrooms, kitchen & living room including a divan, TV & a large balcony with a beautiful view of the surroundings. 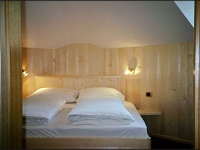 Entrance in the nearby public swimming pool, bed linen, towels, electricity and water are included in the price. 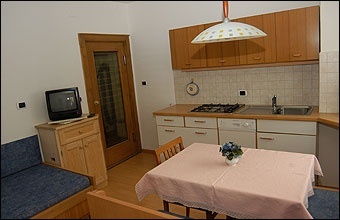 The 42 m² two-room-flat consists of: sitting corner with lovely oriel; kitchen with fridge, dishwasher & coffee machine, two TV with satellite programmes; a lovely bedroom and a smaller one for children (with one or two beds) plus one bathroom. 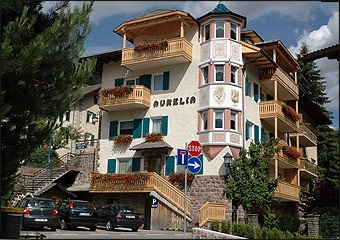 You will also find a 6,40 m² balcony (with chairs and a small table) from which you can admire a beautiful sight on Ortisei. 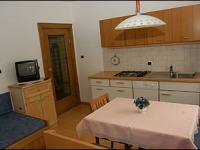 Entrance in the nearby public swimming pool, bed linen, towels, electricity and water are included in the price. 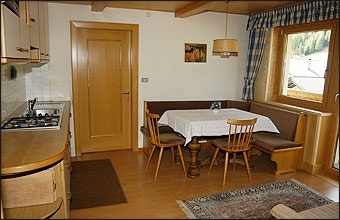 An ample breakfast is served in the homely Tyrolean-style room. 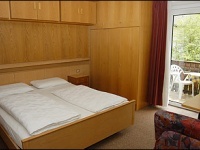 The comfortable rooms include a bathroom, TV & balcony. 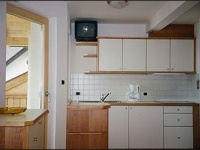 Kitchen use is possible. 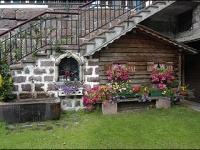 We also have parking spaces available & a small garden. Our guests have free entry to the public Indoor & Outdoor Swimming Pools in Ortisei, which are only a 5 minute walk away. 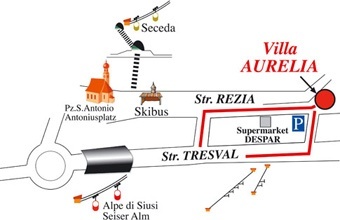 Bed & Breakfast VILLA AURELIA is situated in the centre of Ortisei near the ski lifts, cable car, & ski-bus station. 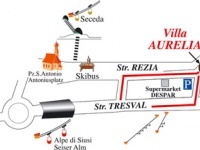 Moreover, we are distant only 300 metres from the main shopping street, from the public escalator (Connection: SELLA RONDA) and near to supermarket, hiking trails & a playground for children.